Saudi Ambassador to Egypt Ahmed Qattan arrived in Cairo Saturday morning to resume his work after having been recalled by Riyadh following protests in front of the Saudi embassy in Cairo demanding the release of activist Ahmed El-Gizawi who was arrested recently on arrival to Saudi Arabia. Saudi King Abdallah Bin Abdel Aziz said Friday that the Saudi ambassador would be back in Cairo within 48 hours, after King Abdallah met with a top level Egyptian delegation visiting Saudi Arabia Friday in an effort to fix strained ties between the two countries. Qattan will officially resume his work Sunday, as will Saudi consulates in the governorates of Cairo, Alexandria and Suez. The Egyptian delegation, which arrived to Saudi Arabia Thursday night, was headed by People's Assembly Speaker Mohamed Saad El-Katatni. It consisted of 124 members, including heads of parliamentary groups and representatives of the Egyptian Coptic Church and Al-Azhar institution. Last Saturday, Saudi Arabia decided to withdraw its ambassador from Egypt and close its embassy and consulates in the country. 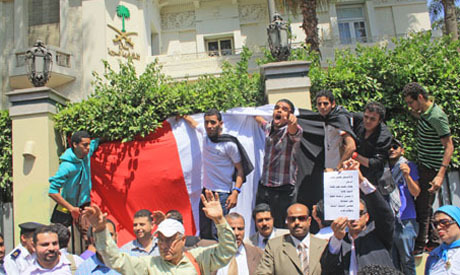 The move came following protests in front of the Saudi embassy in Cairo, and attempts to storm the building. The angry demonstrations were kicked off after Saudi authorities arrested Egyptian lawyer and activist Ahmed El-Gizawi in mid-April on allegations that he tried to smuggle narcotics into the conservative kingdom.